VIMS, Penn State University – Coastal waters play an important role in the carbon cycle by transferring carbon to the open ocean or burying it in wetland soils and ocean sediments, a new study shows. The research helps establish how coastal processes influence atmospheric carbon dioxide levels and, in turn, climate. The study team, which includes Virginia Institute of Marine Science researchers Elizabeth Canuel, Marjy Friedrichs, and Pierre St. Laurent, constructed the first known carbon budget for the East Coast. They tracked the flows of organic and inorganic carbon into and out of coastal waters from the southern tip of Nova Scotia, Canada, to the southern tip of Florida. Cycling of carbon in the open ocean and on land has been the focus of much research, but lead author Raymond Najjar says intervening coastal waters have “fallen through the cracks.” Najjar is a professor of oceanography in Penn State’s College of Earth and Mineral Sciences. Planning for the research project began during a workshop at VIMS in 2012. Since then, the study’s 30 authors have gathered data from dozens of published studies to quantify how much carbon enters, exits, and is transformed within the study area’s coastal waters. They report in Global Biogeochemical Cycles that about 20 percent of the carbon entering coastal waters from rivers and the atmosphere is buried, while 80 percent flows out to the open ocean. “Efforts like this help fill gaps in knowledge and inspire further research to help refine carbon budgets for the region,” Canuel says. 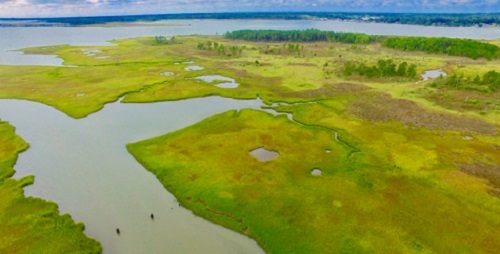 Indeed, Friedrichs and St. Laurent have already began follow-on work to resolve one of the biggest uncertainties in the recent study— the magnitude of carbon flow between large estuaries like Chesapeake Bay and the waters of the continental shelf, and how this may have changed over the past century. Canuel and her students likewise continue efforts to develop high-resolution measurements of carbon transferred across the marsh-estuary interface. The researchers also recognize that their recent budget exercise is not static. Models are the primary way scientists predict future carbon dioxide levels in the atmosphere, which in turn tell us how much the global surface temperature will rise from the greenhouse effect. But for greatest accuracy, these models must also incorporate the flow of CO2 and other forms of carbon through soils, plants, animals, and other components of the global carbon cycle — including coastal waters. The current study subdivided the coastal waters of the eastern U.S. into tidal wetlands, estuaries, and continental shelf waters. The team found tidal wetlands and estuaries — as typified by Chesapeake Bay — buried more than half the region’s carbon (62 percent), despite being the smallest ecosystems in the study domain. Tidal wetlands — only 2.4 percent of the study area — buried 42 percent of the carbon. Estuaries — 9 percent of the area — buried 20 percent. The researchers attribute this to the relatively shallow water in tidal wetlands and estuaries, as well as the fact that rivers bring an abundance of nitrogen and other nutrients to these ecosystems. Carbon burial is an important metric when it comes to predicting future atmospheric CO2 levels because, once carbon is in the sediments, it has the potential to remain there and not contribute to the greenhouse effect. “As sea level continues to rise and disturb the coasts, some of the buried carbon could be respired and released to the atmosphere in the form of carbon dioxide,” Najjar says. The team used a mass-balance approach for their calculations, which assumes the total amount of carbon that enters a system equals the amount that leaves. Carbon cycling within coastal waters is complex and the team sought to identify how carbon flows into and out of tidal wetlands, estuaries, and shelf waters. They compiled data from many studies and for the first time synthesized observations and numerical model output to develop a cohesive view of the carbon cycle in a large coastal region. The scientists also identified carbon fluxes where further research would be needed to reduce uncertainties. “A decade from now, with new data and even-better models, we may be able to more accurately estimate how various carbon-cycle processes have changed in the past and are likely to change in the future,” Friedrichs says. Joining Najjar, Canuel, Friedrichs, and St. Laurent on the study were Maria Herrmann and Elizabeth Boyer (Penn State); Richard Alexander and Kevin Kroeger (U.S. Geological Survey); David Burdige, Margaret Mulholland, and Richard Zimmerman (Old Dominion University); David Butman (University of Washington); Wei-Jun Cai (University of Delaware); Robert Chen (University of Massachusetts Boston); Rusty Feagin and Audra Hinson (Texas A&M University); Peter Griffith, Antonio Mannino, and Sergio Signorini (NASA Goddard Space Flight Center); James Holmquist (Smithsonian Environmental Research Center); Xinping Hu (Texas A&M University-Corpus Christi); Michael Kemp (University of Maryland Center for Environmental Science); Leigh McCallister (Virginia Commonwealth University); Wade McGillis (Lamont Doherty Earth Observatory at Columbia University); Cynthia Pilskaln (University of Massachusetts Dartmouth); Joseph Salisbury (University of New Hampshire); Hanqin Tian (Auburn University); Maria Tzortziou (City College of New York and Columbia University); Penny Vlahos (University of Connecticut); and Aleck Wang (Woods Hole Oceanographic Institution). The research was funded by NASA and the National Science Foundation.